The Yellowbrick ClassPredictionError plot is a twist on other and sometimes more familiar classification model diagnostic tools like the Confusion Matrix and Classification Report. Like the Classification Report, this plot shows the support (number of training samples) for each class in the fitted classification model as a stacked bar chart. Each bar is segmented to show the proportion of predictions (including false negatives and false positives, like a Confusion Matrix) for each class. 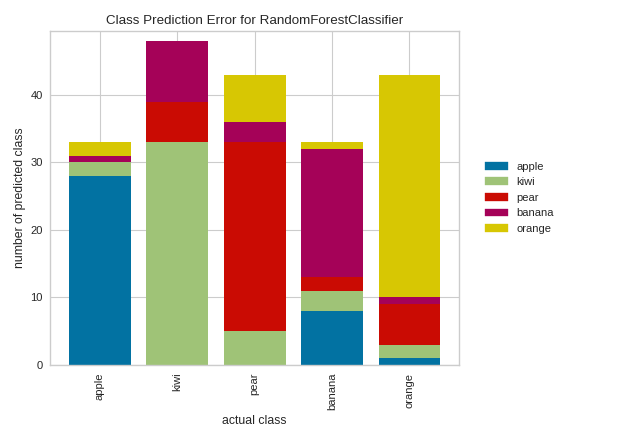 You can use a ClassPredictionError to visualize which classes your classifier is having a particularly difficult time with, and more importantly, what incorrect answers it is giving on a per-class basis. This can often enable you to better understand strengths and weaknesses of different models and particular challenges unique to your dataset. In the above example, while the RandomForestClassifier appears to be fairly good at correctly predicting apples based on the features of the fruit, it often incorrectly labels pears as kiwis and mistakes kiwis for bananas. 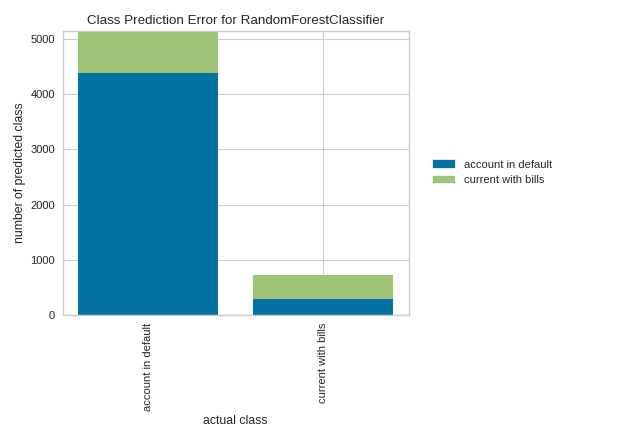 By contrast, in the following example, the RandomForestClassifier does a great job at correctly predicting accounts in default, but it is a bit of a coin toss in predicting account holders who stayed current on bills.